Ten new Heinz cars at Oakdale. The two white cars are the earliest paint scheme with the two yellow cars represent the latest scheme. Heinz changed the paint frequently and even had at least one car advertising a different product on each side of the car. Before I left California to move to Kansas City in 2005, I had started to assemble ten Westerfield kits. All the things associated with moving overcame me, however, and I packed away the kits to be built later. Over the last few weeks, I finally finished them. 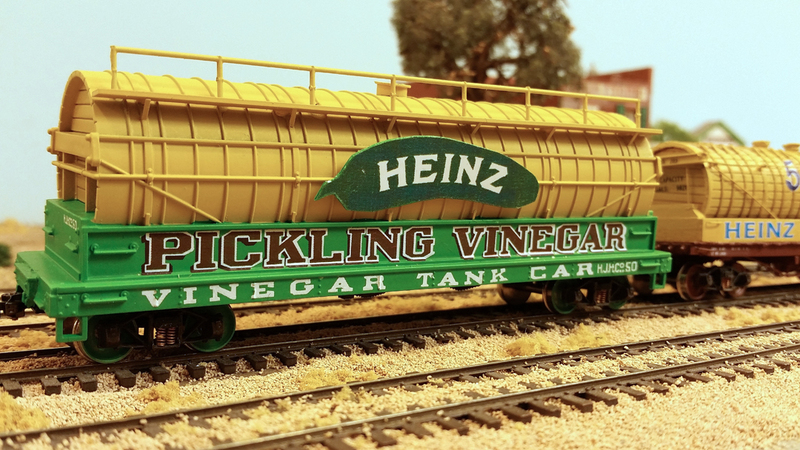 As you can see, they are all based on cars used by the H. J. Heinz Company. 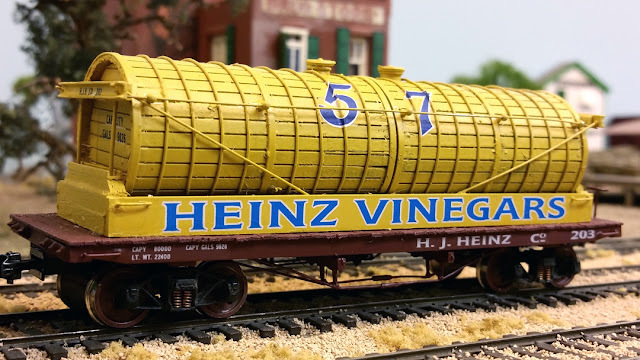 Due to variety of car decorations and the products mentioned, I have always like the Heinz cars. 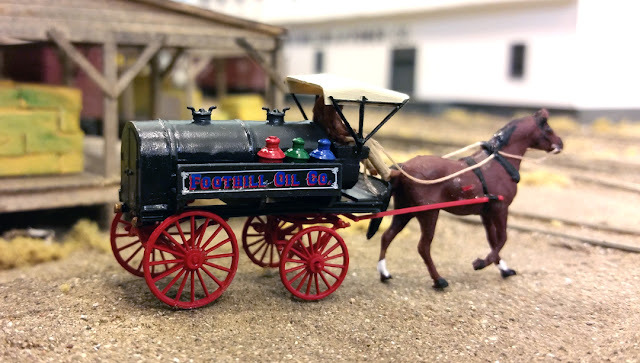 Fortunately for modelers, I guess Westerfield did as well since they came up with numerous lettering sets to adorn their kits. Clover House has done so as well as has Art Griffin. The old Heinz Special Interest Group researching and promoting the cars helped as well. The kits are still available if anyone has any leanings toward condiments being advertised on railroad cars. The cars appear to be refrigerator cars but they are not. 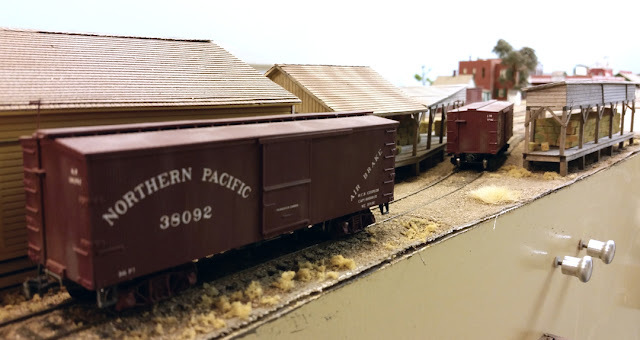 Most of the Heinz "reefers" were built like refrigerator cars but without ice compartments so they were just insulated boxcars. This makes sense as most of the products produced you find right on the grocery store shelves rather than in the cooler. I assembled the cars per the kit instructions. Some of them require swing motion trucks rather than arch bars. I used ones that Westerfield had originally made for these kits and which are not marketed by Wiseman Model Services (http://www.locopainter.com/store/product.php?id=422). They are fiddly to assemble but do look good. When I finally finished the ten-year-old project, I took inventory and found that I still have four more car kits plus enough decals for 15-20 more cars. I doubt that I will build them all but they are fun to look at. The paint scheme was improvised. I figured that buff was a good color for a car originating in Nevada. While I was in the mood to build cars, I decided to try another John Canfield/Bob McGlone kit that I have. It was for a 30-foot Tiffany refrigerator car. Tiffany made an early appearance in the refrigerator car field and was used by many railroads. Their main feature was that the ice was carried in bunkers located immediately beneath the roof, hence the roof hatches on top of the car rather than the ends. 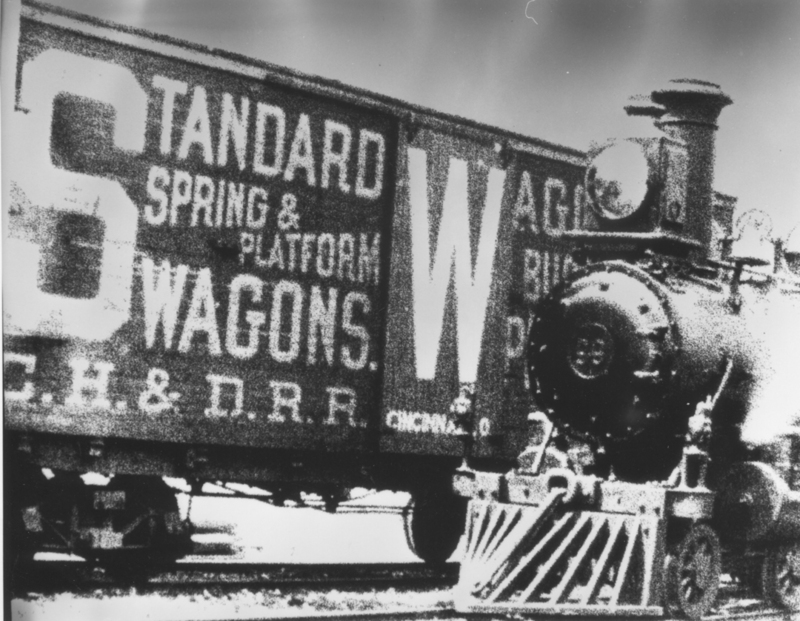 For some time, I had a copy of such a car which was used on the Southern Pacific. 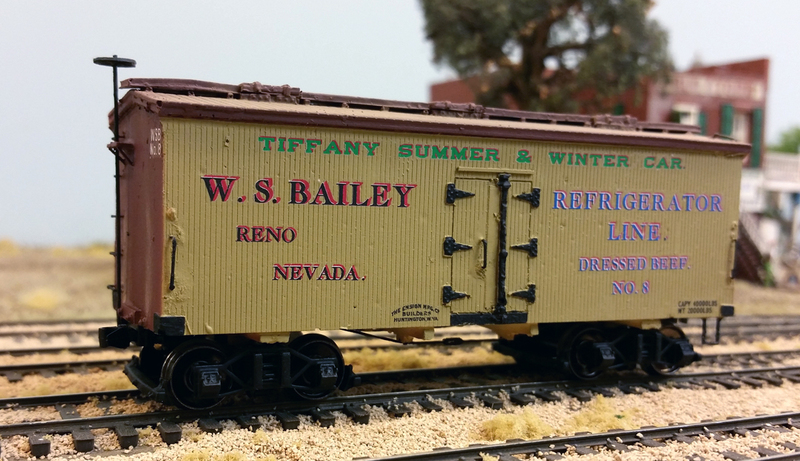 It was lettered for a private owner, a W. S. Bailey in Reno, Nevada. I did a little reading of Reno papers and found that Mr. Bailey was a long-time resident and rancher in Nevada with his ranch located around Churchill. He also had a slaughterhouse on the east side of Reno and used a fleet of refrigerator cars to carry meat to Sacramento, San Francisco and other places. No other information could be found. The drawing showed the basic outline. Although this car is for a 28-foot model, the kit I had was for a 30-foot variety which I figured was close enough. Although the drawing I had did not include lettering styles, it did have the rough lettering diagram. I improvised and designed a plausible lettering set based on similar cars. 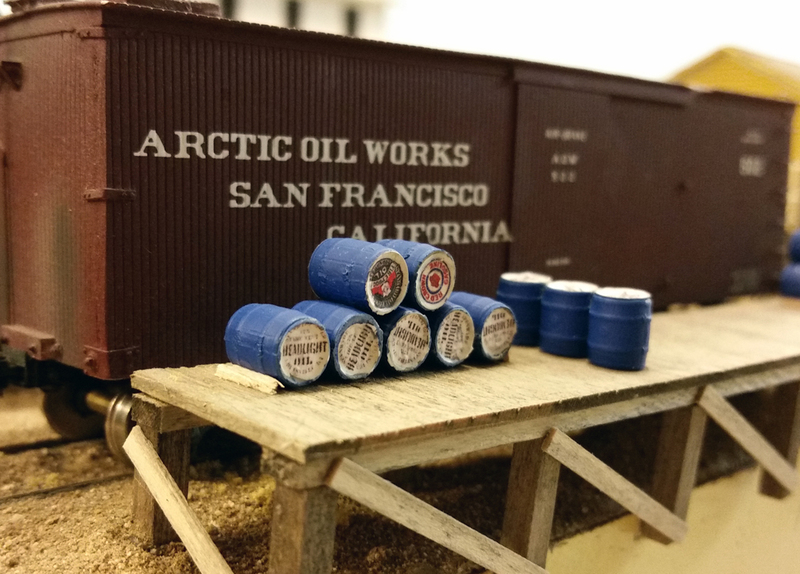 It was an easily construction and used a pair of Eric Cox's 3D printed Allen trucks which are typical of those used on the SP at the time. Some liberties were taken with the design but I think the car is suitable for one where there are no photos or good information on it. The far siding is for the Stockton Agricultural plant while the middle one is for the future Standard Oil distribution center. 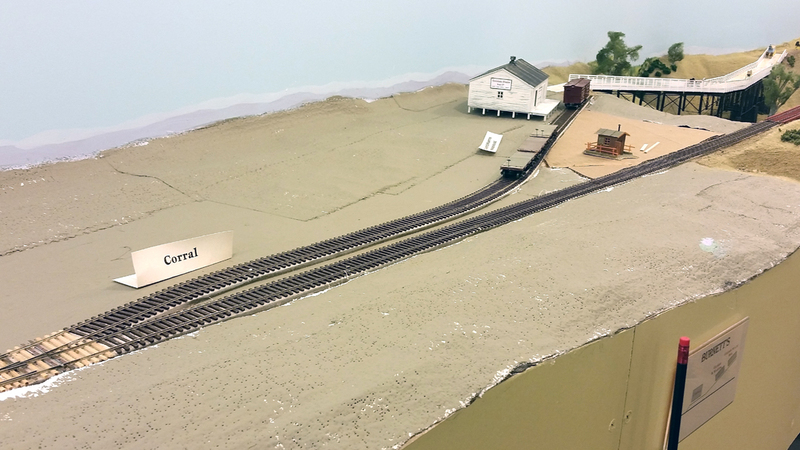 A copper smelter will occupy the area adjacent to the ore cars. The cars themselves were built after similar cars used by the Virginia & Truckee Railroad for hauling ore. 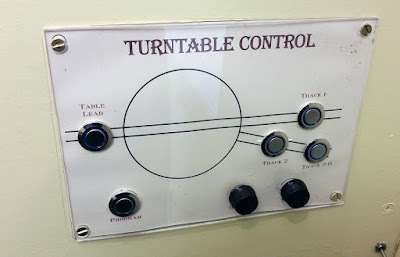 When I am waiting for parts to arrive, I generally find some smaller projects to myself busy. That is what has happened over the past few weeks. 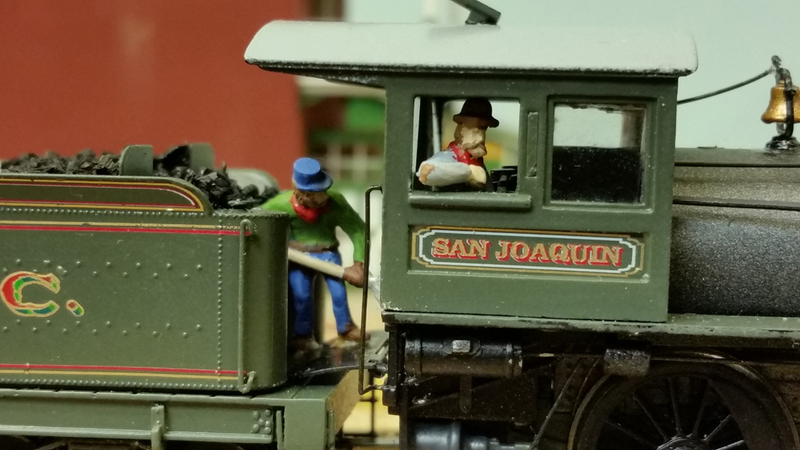 Over in the Stockton area, there were three rail-served industries that had not had track laid to them, mainly because I hadn't decided just how the structures would be arranged. 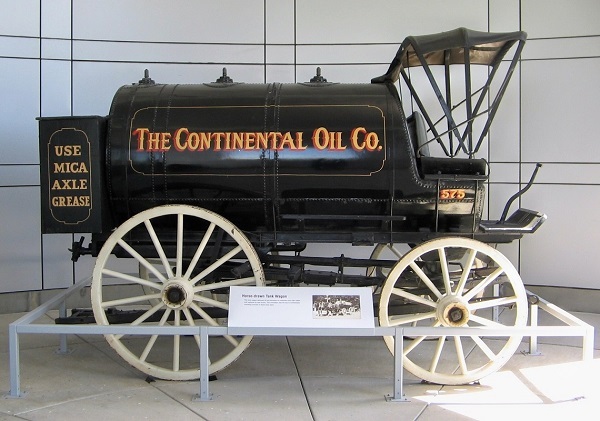 The first industry was the Stockton Agricultural and Manufacturing Company. 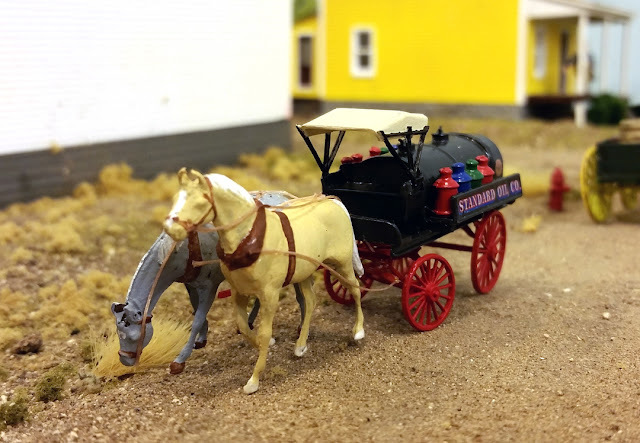 The prototype made all sorts of things from plows to harvesters to steam traction engines. It was a large complex occupying several buildings. There was no way I could accommodate all of the buildings so I had to selectively compress what was there. Using an 1895 Sanborn insurance map, I decided which ones best represented the buildings and laid them out on the plywood sub-roadbed. This location pretty much defined where the Standard Oil Distribution facility would go. The only problem left was where to put the copper smelter. 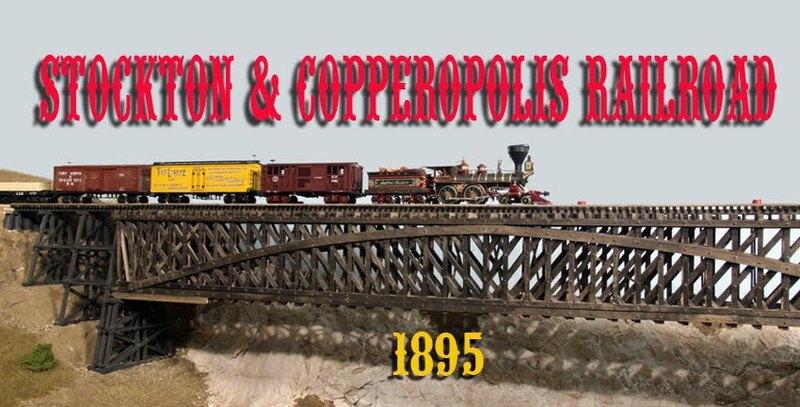 Stockton, in the 1890s, did not have a copper smelter. 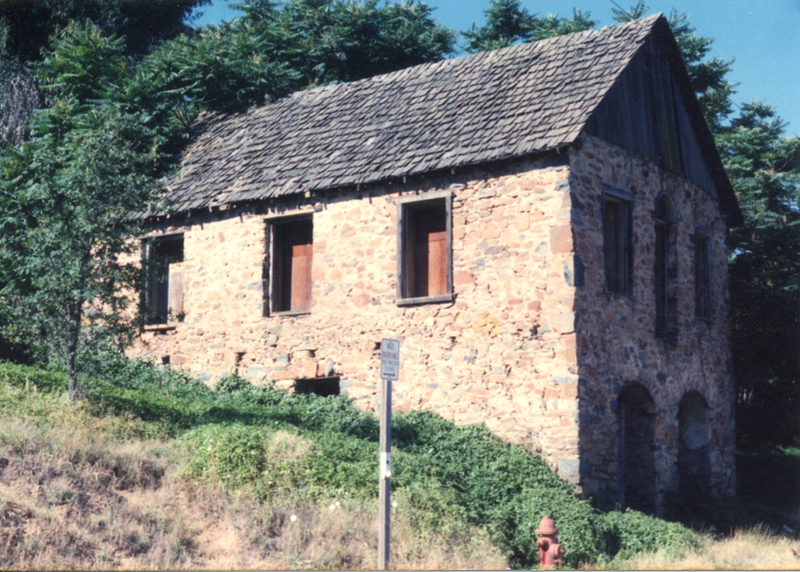 Any ore sent down from Copperopolis was shipped to smelters outside of California. 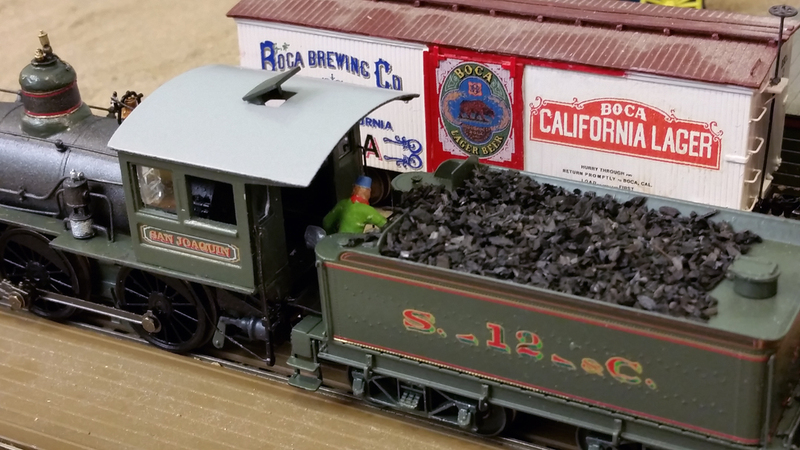 The trouble (for me) was that I had a nice set of 4-wheel ore jimmies that I wanted to use. The only logical way to use them was to carry the ore to a smelter and the only logical place for that smelter was in Stockton. After evaluating every other option I could think of, I decided to install a diamond crossing in the siding tracks. Since the siding that would be crossed was on a curve, a special diamond needed to be built. 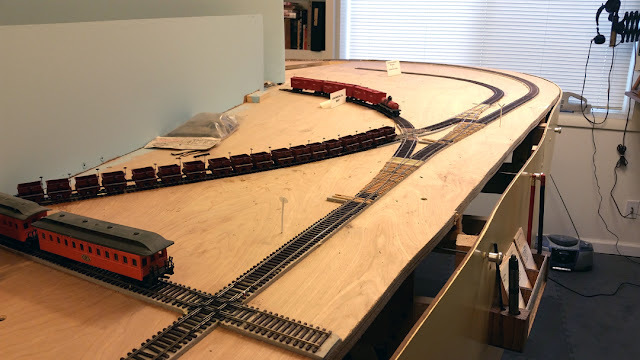 I laid out the curve simply by taping a piece of paper over the track and making a rubbing of the rails on the paper. The location of the other track was marked in the same way. Using that as a guide, I soldered up the diamond on PC board ties. It was not as difficult as I had thought it might be. 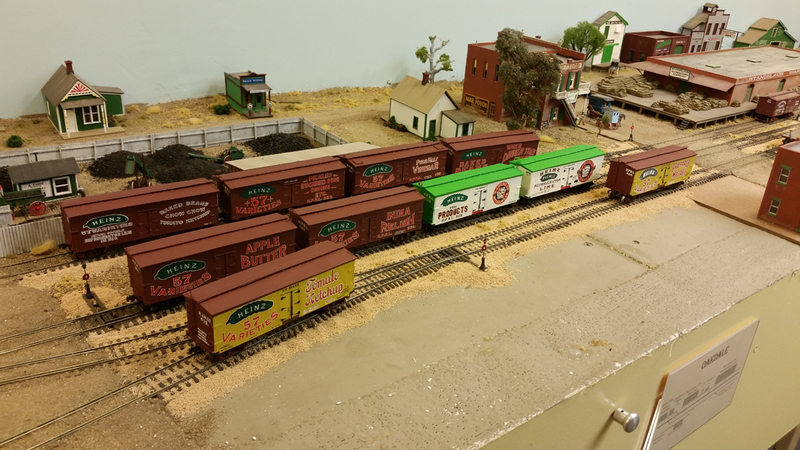 The resulting siding is just long enough to hold the string of empty ore cars as well as the full ones which will replace them. 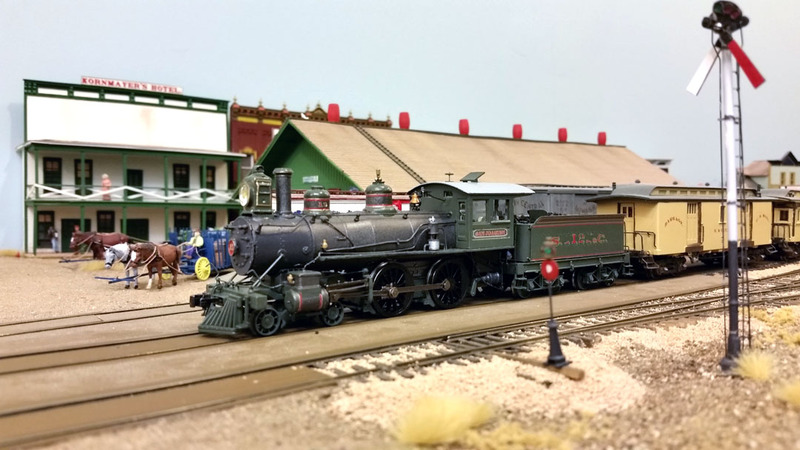 The Canfield-McGlone kit is a good model of the prototype and is easy to assemble. Note the end doors. Another of the small projects was assembling a kit of a car I had been wanting to build for several years. 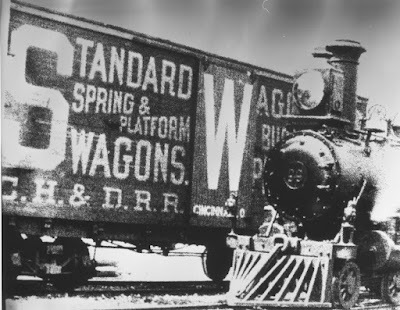 Photos of the Standard Wagon Co. car of the Cincinnati, Hamilton & Dayton Railroad have been around for years. Irv Schulz, Clover House, Art Griffin and even MDC had made cars or lettering sets for it. 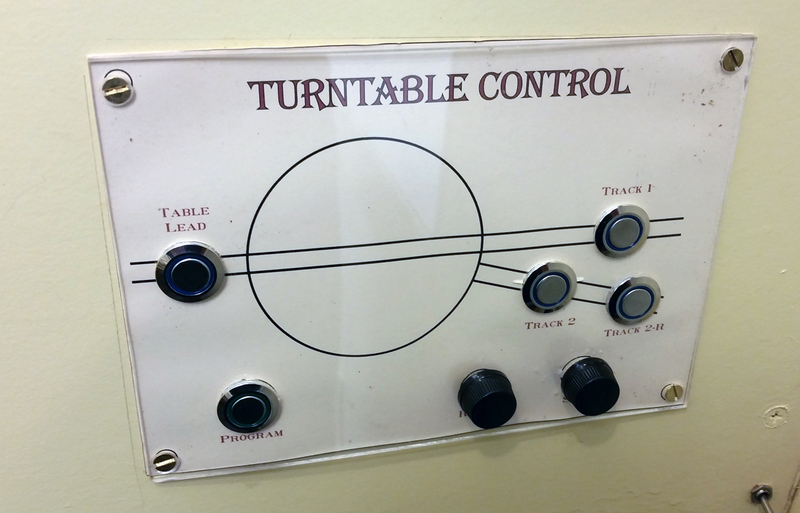 A couple of years ago, John Canfield and Bob McGlone developed a kit for the car which simplified my work immensely. The prototype car was built without air brakes and is pictured here around 1890. The car is interesting in that it was built on an old flat car. The stake pockets are clearly visible along the bottom of the car. The car siding is horizontal which is consistent with it being attached to long vertical stakes. The Official Railway Equipment Registers specifically call out this car as being only for buggies (i.e. relatively light loads) and should not be loaded with heavy freight. The end doors make it interesting. They were typical for carriage and buggy cars. Maybe I will have to build some end platforms on my team tracks. Unfortunately, the car kits were a limited run and are no longer available. They should not be too hard to build, however, using the information from the ORER and the photo. An overview of Burnett's with the corral, general store and warehouses. The scenicking around Burnett's is pretty much complete now. There are still some vehicles and figures which need to be added but I'm happy with how things turned out. The Gilmer & Martin Warehouse is for grain and is a big shipper for the railroad while the Golden State Box Company turns out crates for the area's fruit and produce packaging industry. 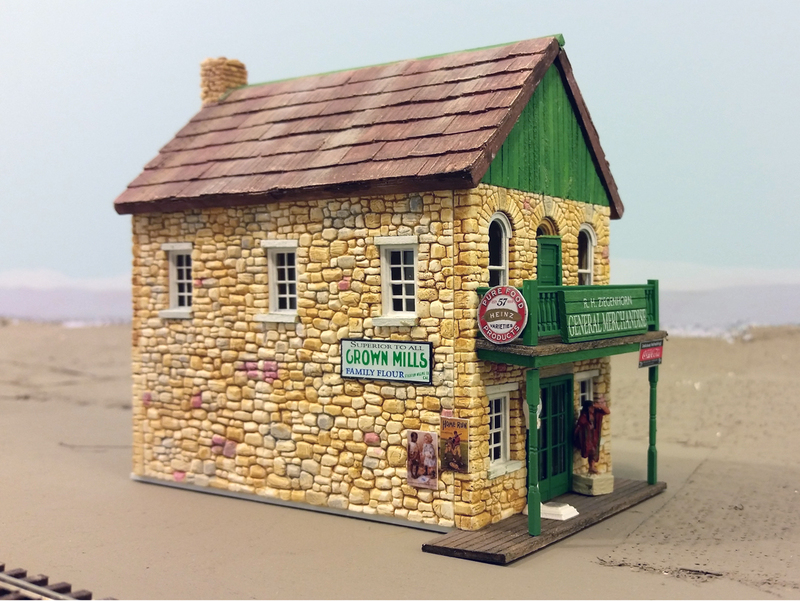 The G&M building is scratchbuilt based on plans found in SP station plats plus some insurance diagrams (no photos found yet). 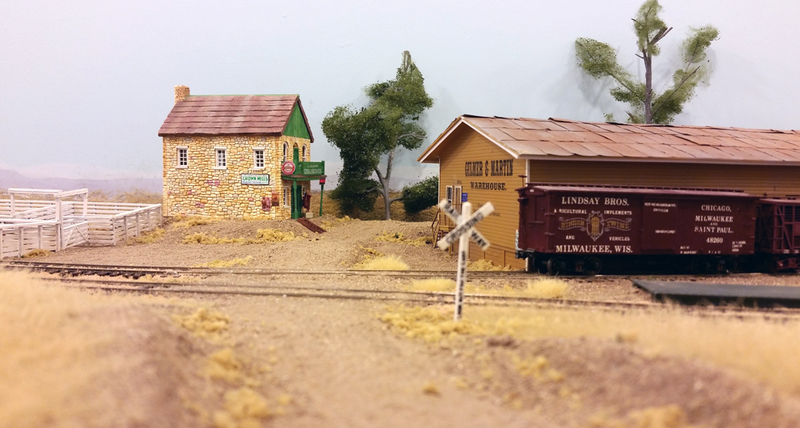 The GS Box building is a Walthers shed to which I added a platform and did some weathering so it would like a little unkempt. The interesting part of the area is that it was not an agency station but it had both a depot building and a storage facility. These are modeled full size. 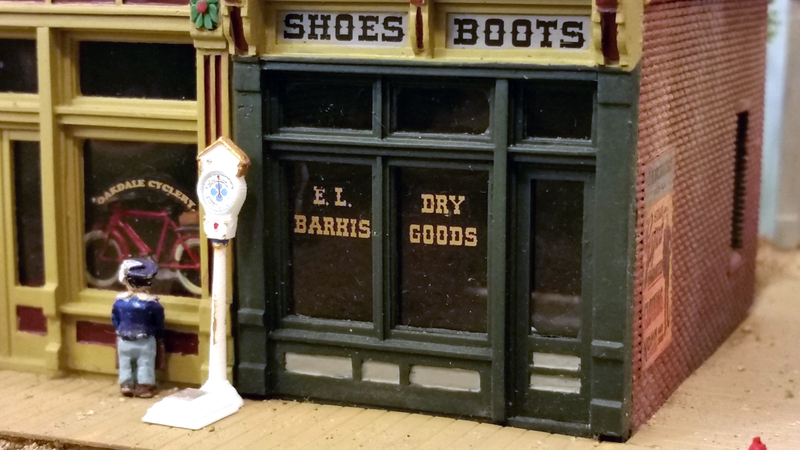 In 1871, the depot building was a saloon but, by 1895, it was a depot so I modeled an enclosed waiting room. The other building was called a barn or just storage. 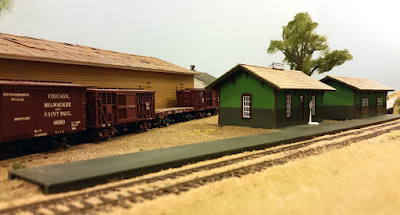 Again, no photos of either so I put together a sort of baggage/storage building and painted it the railroad's color scheme. Looking down the county road into the crossroads of Burnett's shows the general store plus the grain warehouse. 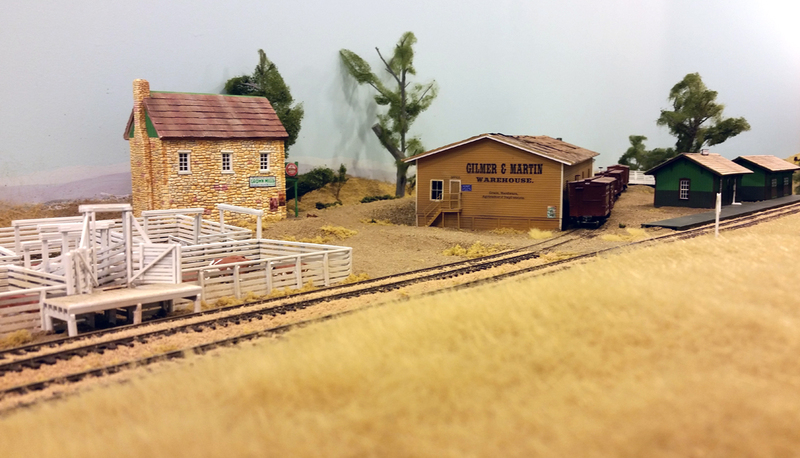 The stock pens were also there so I used a Walthers stockyard kit to make these. Some day, I'm going to have to build up some stock cars. Ziegenhorn's General Merchandise stores rounds out the crossroads area. I may yet add a local blacksmith shop but I need to do some other things first. The S&C's Long Caboose could seat around 32 people plus the train crew so it could take a load off a regular passenger train. 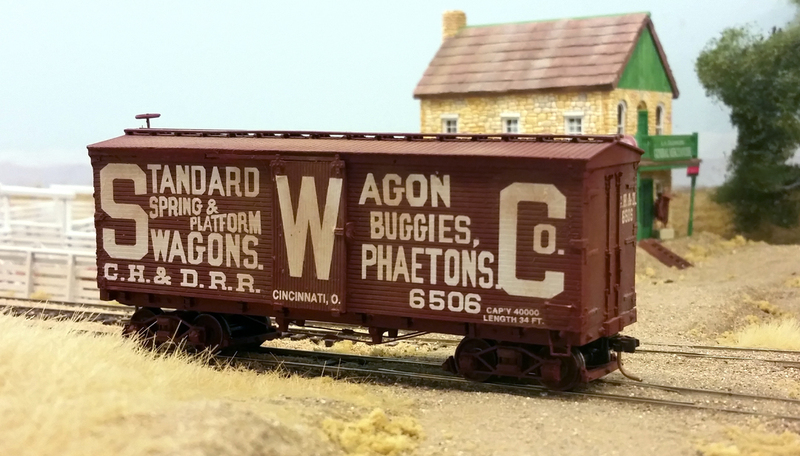 While waiting for things to dry, I started a project I had been looking forward to: a Central Pacific Long Caboose. 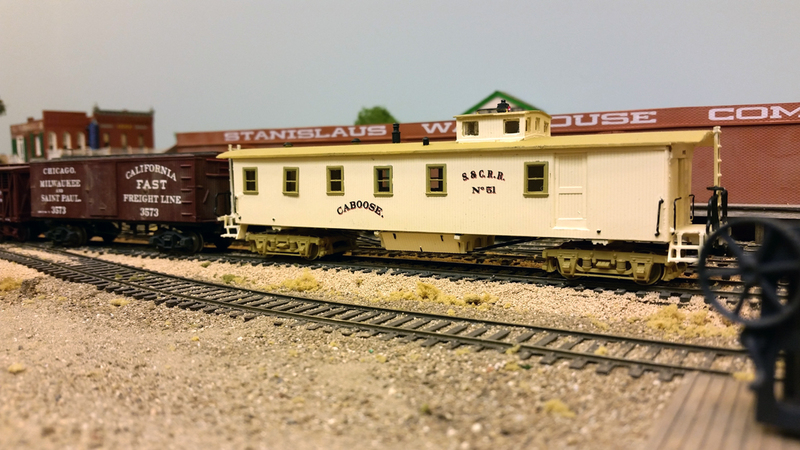 While some folks would call it a drovers' caboose, the CP just labeled it a "long caboose" so that is what the S&C will call it as well. It was obviously designed to carry a few passengers so I may have to convert one of my trains into a mixed. Drawings show the car as being 52 feet long over the end beams. My car was scratchbuilt using styrene with Grandt Line windows. The trucks were an odd size (6-ft. wheelbase) but I found just what I needed on the Shapeways site. What's next? 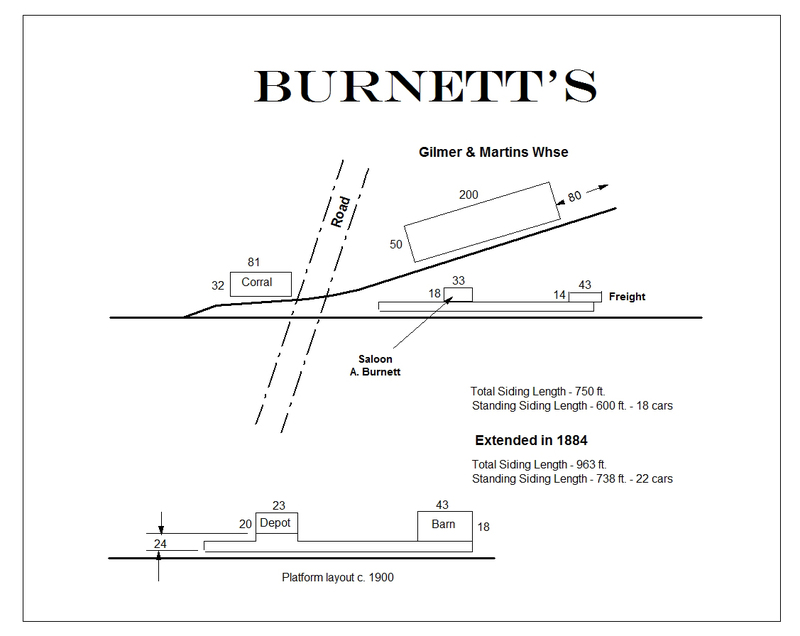 Well, Burnett's was a flag stop but just exactly how did a prospective passenger flag a train? It turns out that several companies made small signals just for this purpose and that will be my next project. 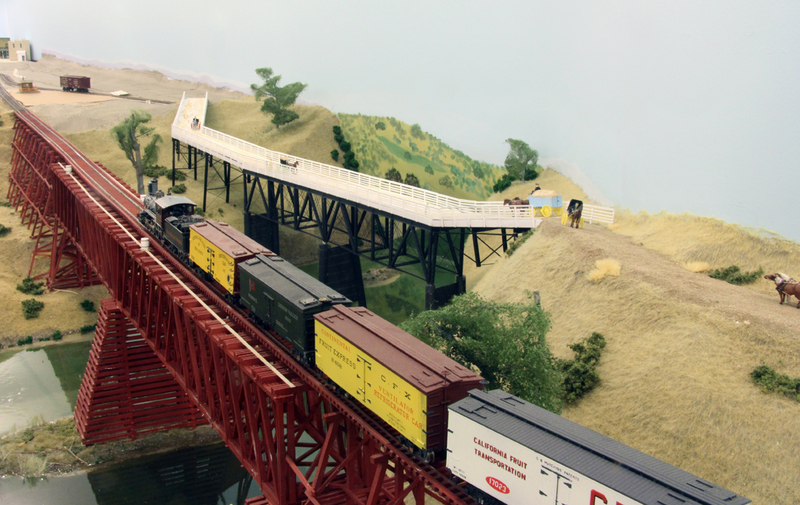 The completed County bridge over the Stanislaus with a Moraga Springs Northern fruit train passing over the railroad bridge. In the distance is the small hamlet of Burnett's. The new iron wagon bridge across the Stanislaus River has finally been completed. 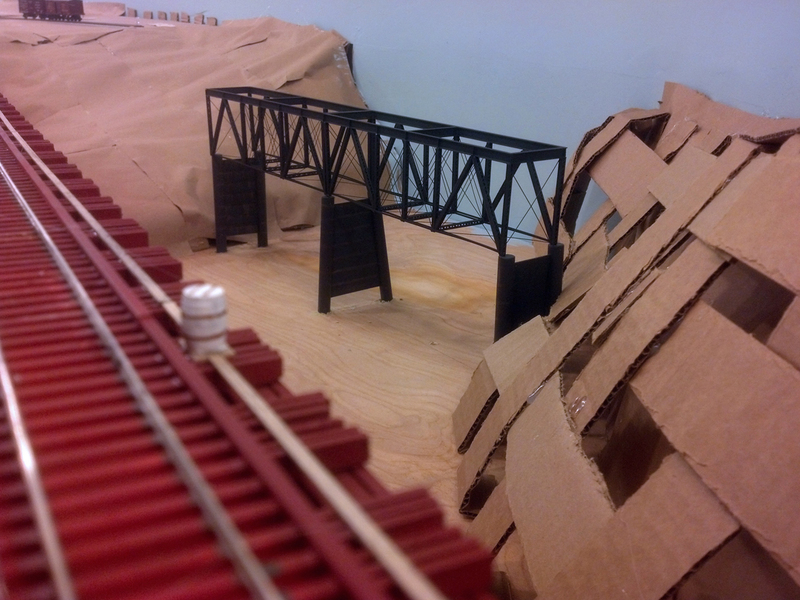 The bridge was constructed entirely from Evergreen styrene sheets and shapes. At the same time, the scenery around the river area was completed. The river is depicted in a low-water stage. California could suffer droughts for several years and the water level would drop. Then, the snow pack in the Sierras would deepen due to a heavy winter and then the river would rise almost to the bottom of the trusses. I have photos of the bridges in both states, quite a difference in the water levels. 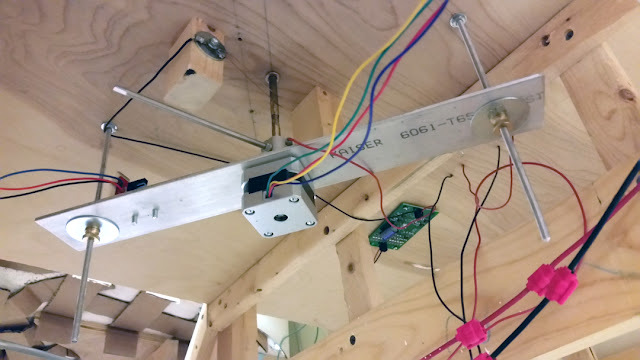 The spindly trusses were made from styrene angle,flat stock and round rod. A couple of sandbars were put in the river with their attendant buildup of grasses and driftwood. The water itself was made by pouring Magic Water into the river area. Along with the river valley, I built a road going from the new bridge back to Oakdale and scenicked the countryside between the two areas. 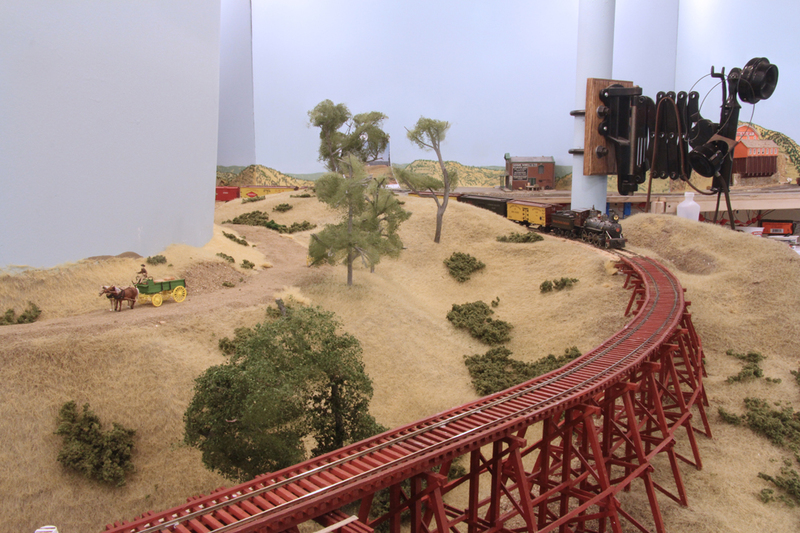 The trees in the scene were made using sagebrush armatures covered with Woodland Scenics polyfiber and sprinkling on a mix of various leaf colors. Before I left California several years ago, I took a trip to Nevada to gather the sagebrush. Upon returning home, I found that the same sagebrush grew within a few miles from my house. Fortunately, I was going to Nevada anyway for a Virginia & Truckee Historical Society meeting. Looking back from the bridge, Oakdale is just on the other side of the backdrop. 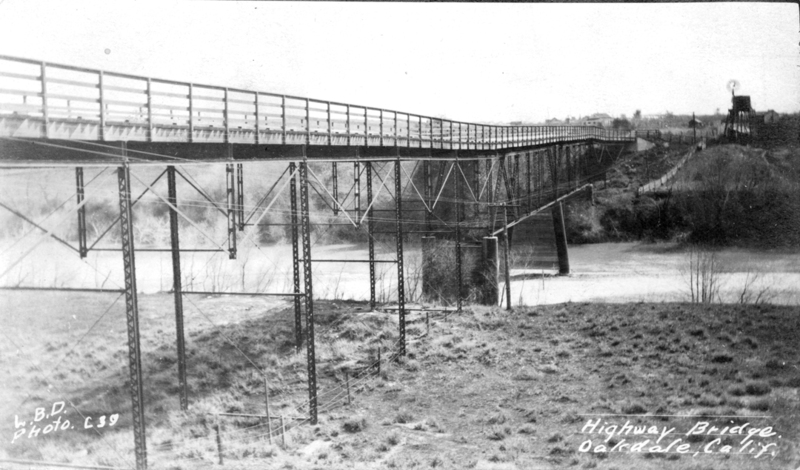 This photograph was taken in 1888 when the bridge was five years old. This view looks south across the river into Oakdale. Enough detail could be obtained from this view to reasonably scale the model. 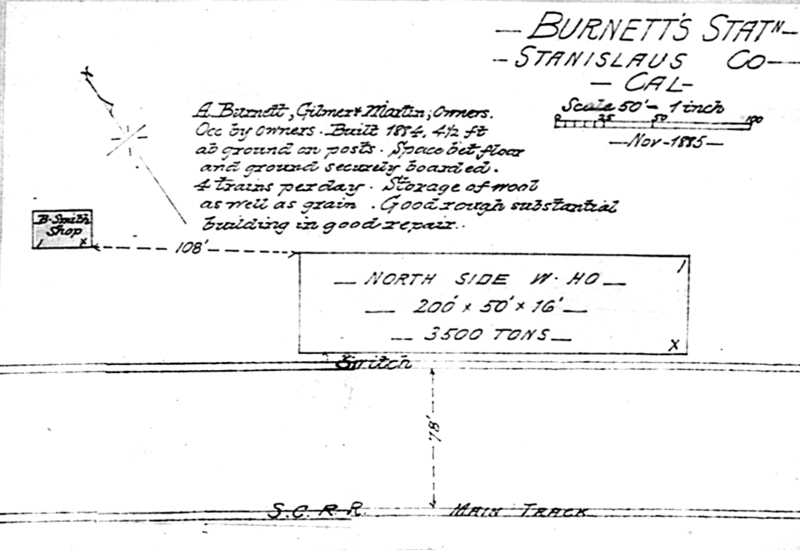 In 1883, the supervisors of Stanislaus County decided to spend $14,739 for a new iron bridge across the Stanislaus River just north of Oakdale. It was a spindly structure but apparently carried wagon, then auto traffic across the river well into the 20th century. 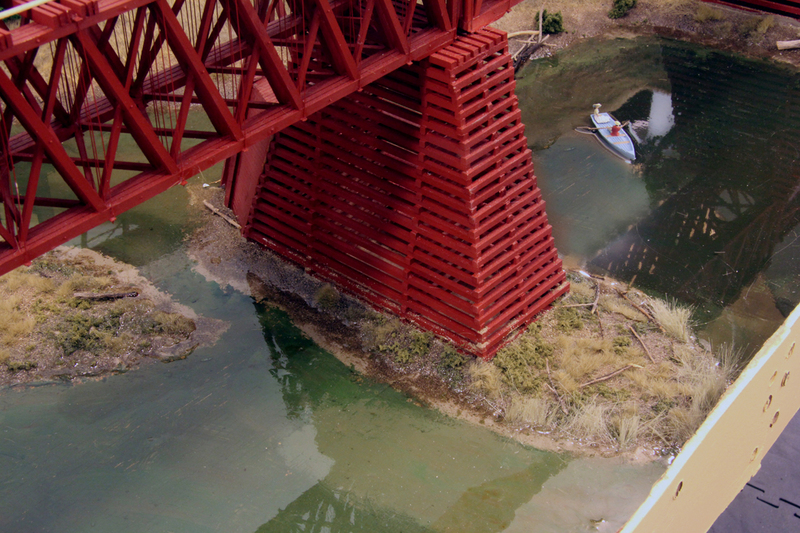 Since the bridge is just upstream from the S&C railroad bridge, I felt that it had to be included in my model. With the piers in place, the river valley can now be scenicked. The road runs along the top of the right-hand hill toward the bridge. In the left distance, bridge approaches will take the road just to the right of the freight cars spotted on the siding. 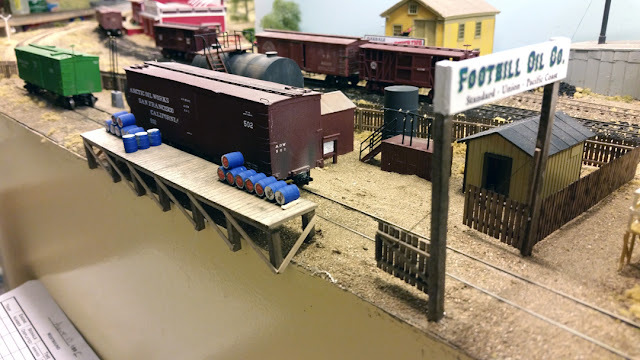 Since I only had one good picture of the bridge, I had to estimate the dimensions and adjust them for the room I had on the railroad. 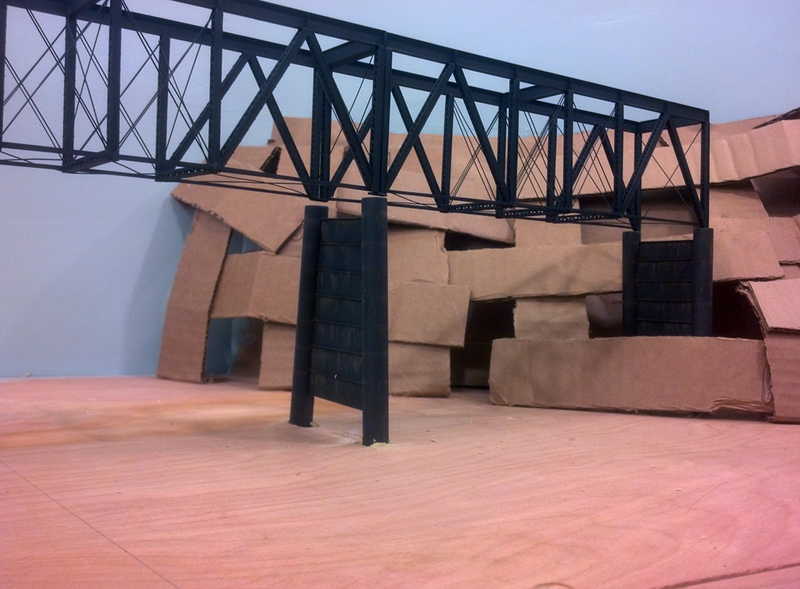 The final length of each truss ended up at 76 scale feet and the roadway is 16 scale feet wide. 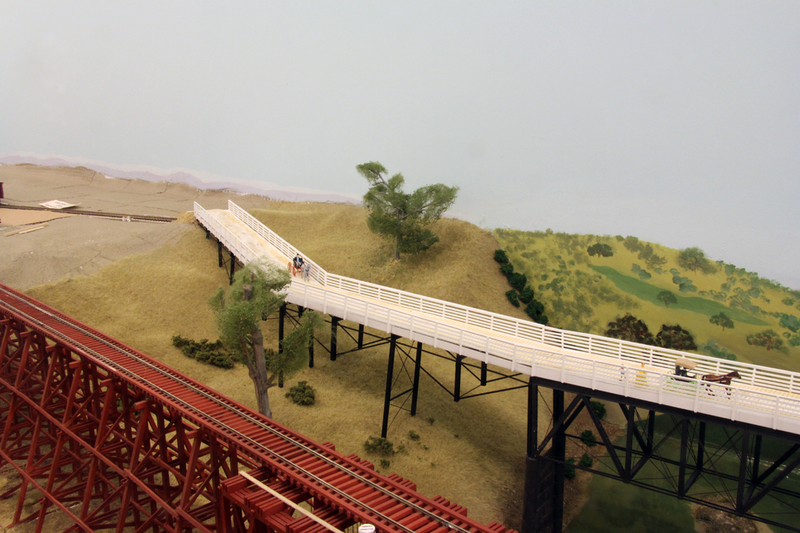 Styrene shapes coupled with Central Valley bridge girders were used in the construction. The cardboard hill had to be extended a bit to shape it properly for the bridge. Plaster cloth needs to be applied yet along with the rest of the scenery. The roadway also has to be attached to the top deck of the bridge. The prototype supports for the bridge consisted of iron cassion piers filled with concrete. According to bridge pictures I found on line, these caissons were formed of sheet iron riveted into tubular sections running about four feet long. These were then riveted together to form the length of the pier needed. Sheets of iron were placed between the piers for stability and to prevent debris from catching on the piers. These were also formed of styrene parts. Archer rivet decals were used for the rivets and Bragdon weathering powder give the piers a slightly rusty appearance. Obviously, the bridge is not yet completed but enough is done so that the river valley can be scenicked. 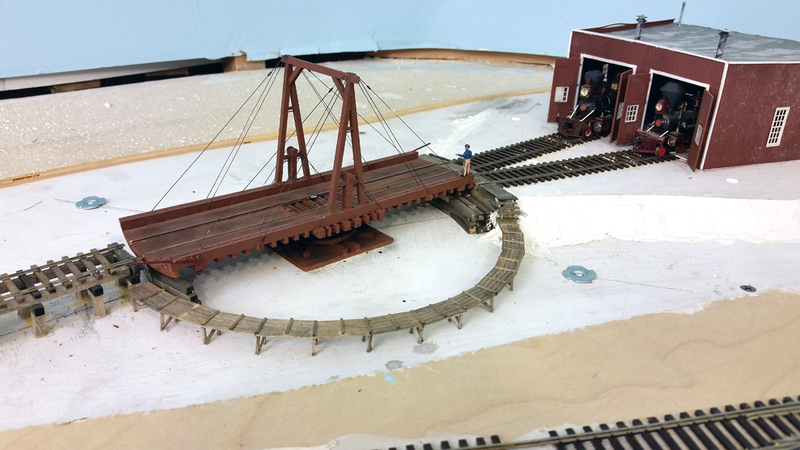 Once that is done, the bridge approaches will be built and everything installed.